The VMAC UNDERHOOD™ air compressor is the best choice for customers who need to save cargo space, reduce truck GVW, and minimize maintenance requirements. All systems feature the patented VMAC rotary screw air compressor that includes a VMAC Lifetime Warranty. For Ford, RAM and GM/Chevy service trucks; ideal for operating small air tools like 3/4“ impact wrenches, light chipping hammers and die grinders. For Ford, GM/Chevy and Sprinter commercial vans; ideal for operating small air tools like 3/4“ impact wrenches, light chipping hammers and die grinders. For Ford, RAM and GM/Chevy service trucks; ideal for operating small to medium sized air tools like 1” impact wrenches, 60 lb jackhammers, backfill tampers, vertical/horizontal grinders and sanders. For Ford and RAM service trucks; ideal for operating medium sized air tools; equipped with digital controls that automatically turn the truck’s engine on or off depending on air use. Perfect for reducing fuel consumption and for areas with emissions or idling regulations. For Ford and RAM service or utility trucks that currently pull tow-behind portable air compressors or have utility mount air compressors; ideal for operating medium to large sized air tools like 90 lb jackhammers, post-pounders and trenchless piercing tools. Less space - VMAC UNDERHOOD™ air compressors free up to 80 cubic feet on the truck deck or cargo area because the air compressor mounts in the engine compartment. 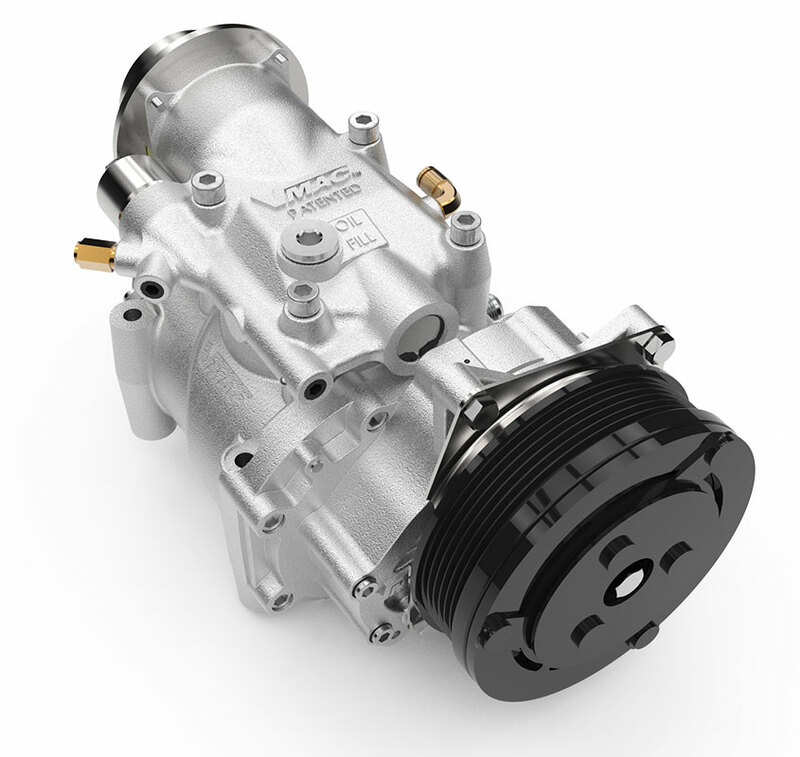 Less weight - VMAC UNDERHOOD™ air compressors reduce truck GVW by as much as 1,900 lbs. Choosing a lightweight air compressor means you’ll be able to add more tools and equipment to your truck, carry more materials, take advantage of better fuel economy, or even downsize your truck classification. Less maintenance - VMAC UNDERHOOD™ air compressors require less maintenance because stand-alone engine driven air compressors have their own engines that require servicing and repairs. More productivity - VMAC UNDERHOOD™ air compressors use patented rotary screw technology designed to run at 100% duty cycle without stopping or overheating, so operators don’t have to wait for their air compressor. Any Environment - VMAC UNDERHOOD™ air compressors are proven to work in any extreme climate, chosen as the air compressor system of choice in arctic and desert environments. "I use a one-inch air gun for tractor trailer tires and my UNDERHOOD™ air compressor doesn’t run out of air." "Time is money, and the VMAC units work very fast." "When we updated our fleet to be more environmentally friendly and lightweight we moved from a 1,000 lb diesel driven air compressor to the UNDERHOOD™ 150 which saved us 800 lbs"
"We have saved almost 260 lbs when installing the VMAC H40 hydraulic driven air compressor instead of the competitor’s comparable air compressor, allowing techs to carry more tools and supplies needed to get their jobs done." "My VMAC air compressor keeps up with anything I’m doing, I can’t outwork it"
"With the UNDERHOOD™ 70-Green Series’ control system, my truck engine is automatically turned off and on with air use." "[The DTM70-H is] so lightweight, which is big on my F550, so I can carry all my tools and equipment without going over weight. " "There is zero lag on air tools under high demand (VMAC G30)"
"We have the DTM70 installed on our service truck and we’re very pleased with it." "I was impressed with not only the performance of the compressor but the best part was how things were engineered to fit properly in the engine compartment as if it was built from the factory." "The D60 delivers good power, and is basically unstoppable! Just turn it on, do your job, and shut it off – it’s a no brainer. " "It is a pleasure being a dealer for VMAC"
"We chose the UNDERHOOD™ air compressor because we wanted to save space in our van’s work area, and we needed a compact air compressor that could provide enough air flow for our jobs." "I would recommend the UNDERHOOD™ to anybody in the tire business who is serious." "The [VMAC Multifunction Power System] unit has been great, reliable and easy to use. I would highly recommend one if someone was setting up a shop/service truck. " "Their products are great and reliable." "With the UNDERHOOD™, you just push the button to start, and get continuous air right away, even in the colder winter months." "UNDERHOOD™ compressors have given us 3 years of of uninterrupted service"
"There’s no downtime, just 100% uptime. It always works"